One of the things I treasure most are the friendships and relationships I've been blessed to have through my Stampin' Up! business. 6 years ago next month, I left my management position with my first direct sales company in order to follow my heart, and where I felt God leading me, and join Stampin' Up!. Nothing in my 13 year direct sales experience at that time could have prepared me for what I found with Stampin' Up!. 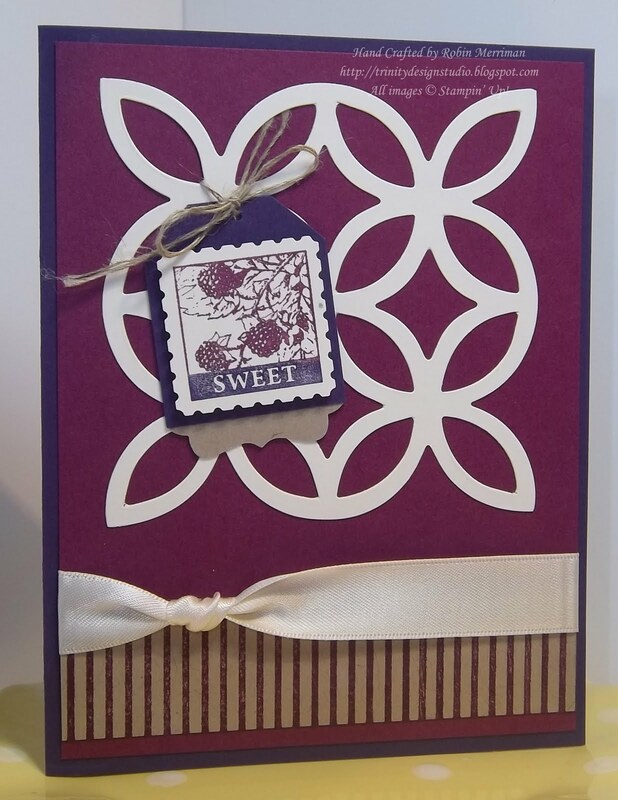 Not only was Stampin' Up! a well managed, thriving, debt free company - a great 'risk' for someone looking to make their way in the direct sales industry, their entire Statement of the Heart revolved around relationships - not money, success or fame - relationships. 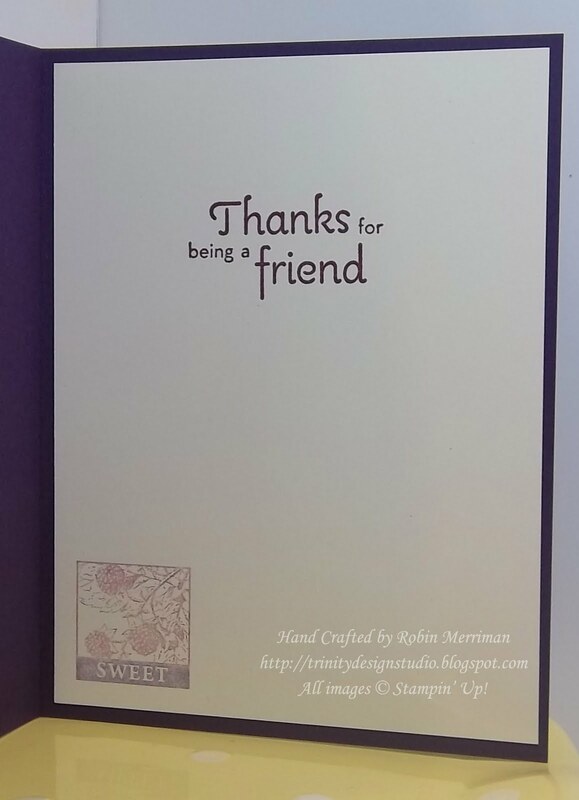 I found that at Stampin' Up! you were not only valued for your business acumen, but for your creativity and your heart. They recognize that business will only take you so far if you don't put the relationships first. Who wouldn't want to be part of a company who thinks this way? Let me share a story from just a few months ago before I continue with my "Why?" of being part of Stampin' Up! See this card? It's my version of a card that was sent to me in April by my friend in Minnesota, Kay Kalthoff. Now, before I joined SU!, I didn't have any friends in Minnesota or in many places outside of Virginia. My world was pretty small. But through SU! I now have friends, real friends - not just acquaintances - all over the USA and Canada. Even a few in Australia and New Zealand. Through the simple art of paper crafting, cards created and sent, artwork and lives shared, I now have wonderful relationships with amazing people in places I haven't even visited! I think because paper crafting is such a personal art, we truly put a piece of ourselves into what we make for others, we can't help but share our lives and our hearts. Isn't that fabulous? Don't we all long for that? I was blessed to meet Kay at Founder's Circle 3 years ago. She is not only a fantastic stamper, but a beautiful person. When she read my blog post about my Dad's cancer diagnosis, she intuitively knew that I'd not have much time for stamping over the next bit of time. So, know what she did? She packaged up a packet of handmade cards, samples from the just released Summer Mini Catalog and mailed them to me with a note that made me cry tears of gratitude. She reached out to me in kindness and caring by giving me a gift of herself. Folks, that's what SU! is all about. Kay's actions embody our Statement of the Heart. Many of you follow my blog on a regular basis and you know what happened later in April, my Dad passed away and left a great big hole in my life. Can I share what happened next? I received literally HUNDREDS of cards from stampers all over the world. Each day the mailbox was full of beautiful, handmade greetings that offered sympathy, prayers and caring. YOU may have been one those who sent me a card and if so, I thank you for your kindness. That's just another example of the heart of Stampin' Up! and one of the many reasons that I treasure my involvement with this company. If you'll allow me, I'd like to share the rest of my story with you. When I joined SU! in August of 2005, I left a solid monthly income from the company I was with, taking a leap of faith by starting over at square one in a company I knew little about. Emma was in first grade, Mark was working a ton of overtime trying to make sure the money met the end of the month and my income at that time was covering our car payment as well as any 'extras' we allowed ourselves. The biggest concern was that car payment -maybe you know what that's like, not knowing if you'll be able to make the payment or not. Not a fun place to be, for sure, but I was sure that Stampin' Up! was where I was supposed to be and stampers, that has proven itself over and over again in the last 6 years. I'd been stamping and scrapbooking for a number of years, but was really just playing at it. I was more of a supply collector (sound familiar?) and not a maker of much. By joining SU! I was drawn in right away and guided along with fantastic training by my leaders and Stampin' Up!. I found that my circle of influence -my family, friends and acquaintances - were intrigued by the idea of sharing something handmade. I invited them to join me in my new journey and host parties and come stamp with me. And that's really how it started. I simply invited my friends to come stamp with me - sharing what I loved with them, having fun with them, creating memories with them. Little by little, my 'business' grew and within three months - really - I was making the entire car payment again and my 'business' was self-supporting. But what was growing even deeper and wider were the relationships I was blessed with. I said it earlier, there's something about sharing something handmade, a part of yourself, that draws others in and expands your circle of friends. Who would think that something as simple as a card would have this power? I'm here to tell you that it does, and it's a beautiful thing. Fast forward to now. Over the past 6 years, God has blessed me in tremendous ways. My 'business' has grown and thrived, ebbed and flowed and grown again. I've been blessed to earn awards and recognition, bonuses and fantastic trips from Stampin' Up! But those would be empty trophies without the relationships formed along the way. But to a person, I know they would tell you that they joined because they saw and felt something different about Stampin' Up! and they knew that being part of this company would bring rewards not tangible, but palpable, meaningful statements of the heart. I love these ladies and am so blessed by them each day. So, having read all this, have you figured out my "Why?". "Why" I choose to do Stampin' Up!? Can I tell you one more reason? It's YOU. If I could, I'd have each of you as part of my team of stampers, if for no other reason than to enjoy our relationship more. While I know that's not possible, many of you are demonstrators already, many of you are not and it's to you I issue this invitation. Joining Stampin' Up! 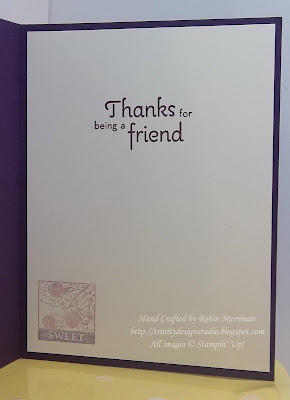 is always a fantastic choice, I think you can see that in what I've shared, and for those of you who purchase Stampin' Up! products on a regular basis, it's a cost-effective choice. Our Demonstrator Starter Kit is an AWESOME value at just $175. And to make it even better for you, almost every piece in it can be chosen by YOU. Yes, there are pre-selected items that are proven best-sellers, however, YOU can choose to substitute any or all of those items for ones that suit your personal style or needs. I can't think of many jobs that let you choose the tools you work with, yet Stampin' Up! does. Once there, click the Join the Fun button at the top right. You don't need any special passwords or secret messages, simply follow the prompts given, choosing your product options along the way. Once you hit submit, you'll receive an e-mail from Stampin' Up! welcoming you to our family and to my team. I'll get the same e-mail so I'll be in touch to welcome you too pretty quickly! Still have questions, concerns? Please ask them! I am an open book as is Stampin' Up! It's smart of you to interview ANYONE you are choosing to be in a relationship with, especially a business relationship. YOU need to be assured that you will receive the support and training you need in the way that YOU need it. I know who I am and what I can do for you, but only you can determine if that's right for you, so I encourage you to contact me. Let's talk, ok? Better yet, let's stamp together!